There is an important difference between describing weather of a place and the climate of a place. Weather refers to the short term conditions of the atmosphere at the local scale. Climate refers to the long term (30 years) conditions of the atmosphere at a regional scale. We can also refer to micro-climates but only in particular to unique climates given the general climatic conditions of the surrounding area. A good example of a micro climate is the urban climate. The British Isles represents the land masses of Great Britain and Ireland, so it also includes the Irish Republic, which is not included in the map to the left. The climate of the British Isles is as you might have guessed rather changeable but can be classified as a Temperate Maritime Climate. Temperate maritime climates are characterised by the absense of extreme climatic conditions. This generally refers to mild winter temperatures and warm summers. Rainfall is freqent but not extreme and the climate generally is free from hazardous atmospheric systems. The climatic conditions in the British Isles are largely related to the influence of the Atlantic Ocean. The Atlantic Ocean acts as heat reservoir, storing warm water through the winter. In the summer, due its thermal capacity it takes longer to warm up than the land around it and so has a cooling influence. Prevailing winds bring air from the Atlantic over the British Isles either cooling or warming it but most certainly bringing rain! As we can see from the two charts there is an interesting contrast in temperature for different regions of the British Isles. Whether it be summer or winter it is clear to see that the climate is colder in the north compared to the south. Closer examination of the map also reveals that western parts of the British Isles, including Ireland and Wales, as well as the coastline of Western England and Scotland are colder than more eastern regions. If we were to draw a straight line northward through the centre of Britain and then plot its changing termperature on a line graph we would see a sloping line. The temperature line would have a gradient. The change in temperature over space is called the temperature gradient and this can be observed in the data both on a south to north transect as well as a west to east transect. There are a number of influencing factors. These include, latitude, oceans and ﻿﻿altitude. Firstly, and perhaps the most important in regard to scale is latitude. More northern latitudes receive less insolation than sourthern latitudes. This is due to the angle of the sun relative to the axis tilt of the Earth. The equator and the tropics receive more insolation because the sun is highest in the sky relative to the orientation of the earth's surface. The further the distance from the equator the lower the angle of the sun and less insolation the surface receives. This is relevant both at the global scale and in the context of the British Isles. The two diagrams below help show how insolation is variable with changes in the sun's altitude. At a 30° angle a one mile wide ray of insolation is dispersed over a two mile radius. Compared to the equator when the sun is directly above it insolation is dispersed over just a one mile radius. In addition, in upper latitudes solar radiation is required to travel through more atmosphere due to its angle of entry. Having to travel through more atmosphere means more absorption, reflection and scattering of radiation, further reducing surface insolation. It is also important to observe the influence of the Atlantic Ocean on the west coast of the British Isles. As you can see from the map above, the west is significantly warmer than the east. The Atlantic warms the British Isles in two main ways. Firstly, through the specific heat capacity of ocean; the Atlantic acts like a heat resevoir in the winter. As land surfaces cool down quickly the Atlantic retains its heat influencing a milder temperature keeping the west coast temperature a couple of degrees colder than the east. This is most pronounced on the west coast of Ireland. The second reason is the gulf strream or rather the North Atlantic Drift. This is a warm surface current of water, that varies between 7 and 22° Celsius and can be up to 7° Celsius warmer than the water outside the current. It can be seen in the image to the left. A second influencing factor on the British Isles relates to altitude of the land. The influence of altitude can clearly be seen in northern England and Scotland but this also relates to the influence of latitude. However, the higher ground is very recognisable in Wales, the area of blue colder temperatures are directly overlaying areas of higher ground. On average, air temperature fall 0.65° Celsius every 100 meters of altitude. The reason for this relates to how the atmosphere warms in the first plce. Remember insolation? Insolation is tha amount of incoming solar radiation that is absorbed by the Earth's surface. This insolation is then re-radiated back into the atmosphere in the form of long wave radiation. The vital difference in warming at altitude relates to the fall in surface area of land at increased altitude. Simply put, the higher you go up the less surface area there is in relation to amount of air at that altitude. Therefore, less air is being radiated by the surface. There are also a number of feedbacks at work, for example above the snow line, snow cover will increase albedo and reduce insolation. The gradient of the slope is also a factor that impacts the amount of received insolation. Steeper slopes receive less insolation than more gentle sloping faces. A second important reason relates to air pressure. With increased altitude, air pressure falls. This is due to a decrease in the weight of air above it. As pressure falls air expands and so the ability of air molecules to collide and produce kinetic energy decreases. This loss of kinetic energy results in a fall in temperature. A final factor influencing temperature in the British relates to prevailing winds and their impact on air masses. A prevailing wind is the dominant most frequent wind direction. If the prevailing wind is from the north the British Isles will experience colder temperature. If the prevailing wind is from the south, the British Isles will experience warmer temperatures. Air mass characteristics are influenced by many factors and so need to be explored in more depth later. When examining climatic characteristics of a region it's important to take the long term view. Remember a climate is the long term condition of the atmosphere. For example, there is an important difference between the two maps below. The first image shows the average annual rainfall between 1971-2000. The second image shows the rainfall for an 8 day period in November 2012. We should avoid drawing too many conclusions from this one. The long term pattern is very clear to see. The western side of the British Isles gets significantly more rain than the east. Scotland and Wales receive more rain than England. The reaons that explain this relate to the patterns of prevailing winds and of course the influence of the Atlantic Ocean and finally the altitude of land. The dominant prevailing wind over the British Isles are the westerlies that track over the Atlantic Ocean. These winds increase the rates of evaporation and as they travel receive large quantities of water vapour. As winds reach the British Isles, warm air is forced to rise orographically as the relief of land rises. This vertical movement of air sets in motion a sequence of processes. Firstly, as air rises, the pressure above it falls and the air expands making it lighter still. Then as air expands, it cools and condenses, rain clouds form and the Western British Isles receive a downpour. This oragraphic process is further compounded by the rising hills of Snowdonia and the Breccan Beacons in Wales, the Lake District and Pennines in England and the Northern Highlands and Grampians in Scoltand. The seaward facing slopes of hills and mountain ranges found in the Western British Isles can be referred to as the windward side and it is this face that receives most rainfall. The eastrern slopes of these high lands are called the leeward side and there is a distinct drop in rainfall, often referred to as a rainshadow. On the leeward side air is no longer triggered by relief to rise and so air slowly sinks. As air falls the pressure above it increases. Sinking air warms and due to its warmth it has lower relative humidity. This means that it can lock water vapour inside it and so condensation cannot take place. The process of relief rainfall is explained in the following video originally sourced form the BBC archive and set in New Zealand. Another factor leading to rainfall over the British Isles is the interaction of air masses. This type of rainfall is called frontal rainfall. Frontal rainfall occurs at two different boundaries called the warm front and cold front. At a warm front light warm air rises over the colder dense air. This occurs because of temperature and density difference. As the warm air rises oragraphically, it cools and condenses and produces rainfall. At first quite heavy rain followed by light persistent rain. At cold fronts, a wedge of cold air moves in quickly behind a band of warm air, undercutting it. This causes the warm air to ride up the cold air quite suddenly. This creates great instability and sudden heavy rainfall that is sometimes accompanied by thunderstorms. Because of the track of fronts moving from west to east the west of the British Isles is often effected by fronts more and due to the friction with higher relief in the west, fronts are often slower moving on the west side in comparison to the east. Air masses are large parcels of air with homogenous climate characteristics of temperature and humidity. They form in high pressure regions where air spends a lot of time standing still and where atmospheric conditions are calm. In time though this air begins to move away from these high pressure zones and as it does it interacts with the surface characteristics that it moves over. Air masses derive their name from both their source region and the nature of the surface they travel over. For example, Polar Maritime refers to an air mass that formed in the polar region over Northern Canada but travelled to the British Isles over the Atlantic Ocean. In Britain there are six air masses that at different times influence the climate and weather. The diagram to the left shows their source regions. The most dominant air masses influencing the British Isles is the Polar Maritime followed in second by the Returning Polar Maritime. The British Isles are quite unique in their location as they stand on the Polar Front. The Polar Front is the line of latititude that marks the path of the Polar Jet Sream. It is along the Polar Front that different air masses collide and the result is a complex and variable climate. The following Met Office PDF is an outstanding resource. Mid-Latitude depressions are low pressure systems that form over the Atlantic Ocean on the Polar front. They are large systems that move eastwards and bring with them a sequence of distinct weather patterns associated with their characteristic fronts. Depressions also follow a disinct life cycle. The animation to the left shows their formation, maturity and decay as they approach the British Isles. Depressions form as a direct result of the pattern of oscillation within the moving Polar Jet Stream along the Polar Front. The oscillation of the jet stream creates a distinct pattern of ridges and troughs. Each trough within the oscillation marks a low pressure zone that forms as a result of rising air from the trough and each ridge marks a high pressure zone due to the subsiding of air. Depressions form as small waves on the ploar front called embryo depressions. The small wave marks an injection of warm air from either a tropical maritime or tropical continental air mass into a polar air mass. This wave can be seen in the synoptic chart and satellite photograph below. The wave indicates the second process that feed into the process of forming depressions. This warm air being lighter than the dense cold air rises up above the cold air. Together through the turn and rise of the jet stream and the lifting up of warm air above the dense cold a mid-latitude depression is born. Overtime the depression may either weaken or develop to form a distinctive mature depression. The mature depression is characterised by two distinctive fronts, the leading warm front and warm sector, followed by the cold front. Once a mature depression has formed, the weather patterns of the British Isles are likely to follow a distinct sequence, which can be seen in the cross section below. It's important when describing this change in weather that you develop sufficient depth and breadth and refer to more than just rainfall and temperature. In addition to this sequence you should also comment on the types of clouds that develop. The warm front is dominated by stratus-form clouds that vary in type and the cold front is dominated by towering cumulonimbus clouds. The warm front is easier to identify on its approach as it is marked out by a leading band of high cirrus clouds. The cold front is often difficult to identify because the cloud cover in the warm sector is often at eight octas. As the system moves eastwards, the faster moving cold air mass catches up the lighter warm air mass and begins to undercut the warm sector. The cold air mass moves faster because the warm air mass is subject to greater friction. Once the warm sector is completely undercut the depression becomes occluded. Occlusion generally marks the lowest point of pressure in the system but it also marks the beginning process of decay within the system. Once a depression becomes fully occluded the cold front has cut off the suply of warm air to the system and the system weakens. The patterns of moving warm air and cold air within depressions has more recently been modelled and presented in the follwing graphic as a series of conveyor belts. In the graphic to the right these conveyor belts can be clearly seen. The warm conveyor belt moves along the leading edge of the cold front and rises upward at the warm front. The cold conveyor belt moves along the warm front in front of the moving warm conveyor belt. The system only decays once the cold air marked by the cold front completely cuts off the supply of warm air in the warm conveyor belt. An anticyclone is a region of high atmospheric pressure relative to the surrounding air. They can be large systems up to thousands of kilometres in diameter and are also known as a high or high-pressure system. Anticyclones appear on synoptic charts as a series of concentric, widely spaced isobars of 1000 mbs and above. The closed circular isobar at the center indicates the area of highest pressure. Mid-latitude anticyclones can be divided into warm and cold anticyclones. They often form as partof the osillating track of the Polar Jet Stream and can be found beneath the leading edge of ridges in the upper-air westerlies, where they may be associated with blocking weather patterns. The centre of an anticyclone has a characteristic pattern of air circulation, with subsiding air and horizontal divergence of the air near the surface. The name anticyclone comes from the circulatory flow of air within the system, seen above. Anticyclonic circulation has a local circulation that is opposed to the Earth's rotation. Winds, generally light, circulate around the high pressure centre in a clockwise direction in the northern hemisphere and anticlockwise in the southern hemisphere. 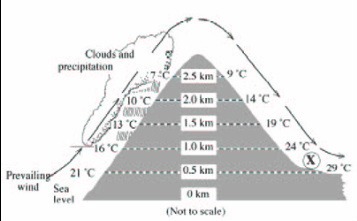 The subsiding air compresses as it descends, causing adiabatic warming. The eventually warmer and drier air suppresses cloud formation beacuse it lock water vapour inside it. Warm air can hold much greater quantities of water vapour and so have a lower relative humidity. Therefore, anticyclones are usually associated with clear skies and dry warm weather in the summer. The same can be said for winter anticyclones except to say that in the winter due to the lower altitude of the sun and rapid loss of insolation tdue to cloudless skies the weather is very cold in some cases morning fogs are experienced. Calm settled weather is usually synonymous with anticyclones in temperate latitudes. Due to calm conditions anticyclones are typically relatively slow moving features. Mid-latitude anticyclones can be divided into warm and cold anticyclones. Mid-latitudes anticyclones are often located beneath the leading edge of ridges in the upper-air westerlies, where they may be associated with blocking weather patterns. Most anticyclones will last for several days but in some cases they become blocked and can remain for a much longer period of time, perhaps 2-4 weeks. Blocking anticyclones can be associated with droughts in the summer and extended cold spells in the winter. Another charactristic of a blocking anticcylone is the shift southwards of the usual pattern of low pressue systems of the polar front. This can be linked to heavy rainfall in southern Europe. The following Met Office PDF is an excellent read that provides an overview of the British Isles climate as well as the factors that influence it.